Introducing Teach Your Children Well, a downloadable e-book specially designed to help you raise your children Christianly. Short lessons focus on fundamental truths and provide interactive, parent-tested examples and stories for equipping your child with a strong, godly foundation to last a lifetime. Many of these stories are "word pictures," and that's important because children tend to think visually. Each word picture will help you to teach a key truth to your children from God's Word. The word picture will help them see it clearly. This e-book offers a wealth of insights and applications to help you enable your children to grow in their faith and live in the strength of the Lord. "I just received a copy of Teach Your Children Well last week. What I've read so far has been great. The content would make a great parenting seminar to help equip parents to raise children with a biblical worldview.... Thank you again for your work. May the Lord richly bless you." "I purchased your e-book, Teach Your Children Well. I cannot wait to apply the biblical principles you have written about… Thank you and may God continue to bless you and yours." I read this book and learned so much about the basics of Christianity… I will keep this e-book as a reference as my two young children grow… Every believer should have this book in his/her library. 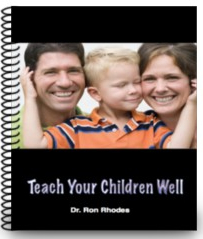 Ron Rhodes' e-book Teach Your Children Well gives parents an easy-to-read, easy-to-apply guide for teaching and training their children about God. Readers of this e-book will find lasting knowledge and wisdom from the Scriptures and learn ways to effectively relate them to children. Each chapter is broken down into sections four to ten pages long. While part of each segment in the chapter is for parents only, there are also "Sharing Time" and "Shortcut to Understanding" sections with a story or "word picture" to help parents communicate the practical teaching of the concepts to their children. Biblical principles are explained in simple terms from examples of popcorn to toothpaste for the young mind to understand. For instance, popcorn in the form of a kernel cannot be eaten. It first must go through the fire for it to become what it was intended to be. So, too, will Christians be tested and tried as each of us achieves his or her potential in life. Teach Your Children Well helps children's faith to grow as they can learn to apply a godly foundation to their lives with solid biblical principles. 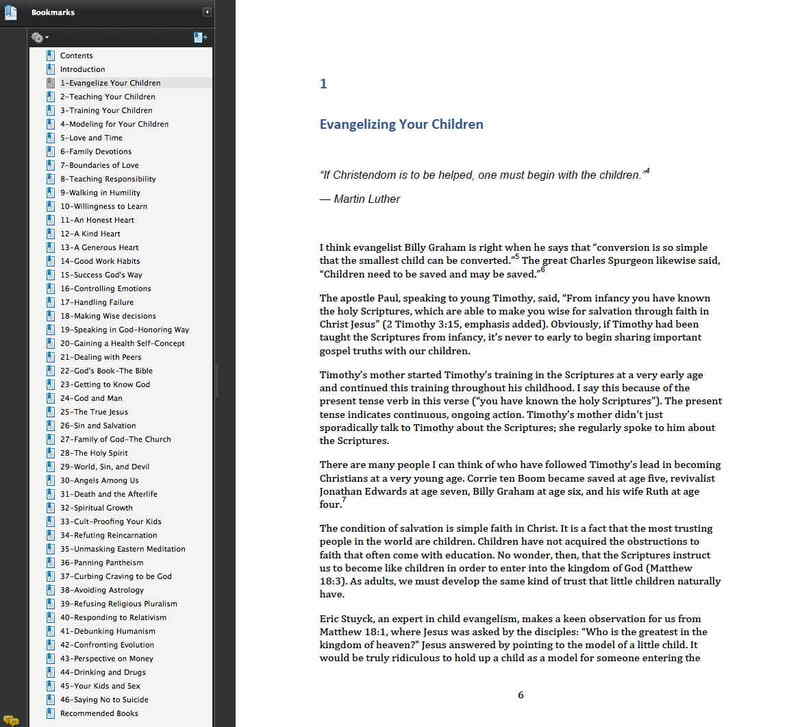 The file format of this e-book is Adobe Acrobat, freely available at the Adobe website for both PCs and Macs. Click here to order the e-book. As soon as your payment is approved, you will be immediately taken to a page on our website where you can instantly download the e-book. If you have any questions, feel free to contact us at this email address: christianparentingcenter@gmail.com.